We came up with this wily fellow. I spent way too much time fighting with this guy’s animations, but I’m quite happy as to how he came out. The biggest thing I’ve been working on recently has been a system to do compound sprites. Compound sprites are when you use multiple sprites to create the appearance of a single, larger object – in the old days of sega/nintendo, these were just used for size, since even seemingly ‘small’ characters like mario or sonic were actually a multiple of the native square-sprite size of the machine they ran on. These days, we don’t have any meaningful size limitations on sprites, so instead we use compound sprites for positioning or animation. 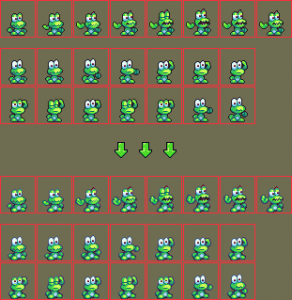 For example, a clock face would easily be done with one sprite for the dial, and separate sprite for the hands – the purpose being that if the clock-hand sprites are separate, you can freely rotate them, programmatically, meaning you can have a full, 360° of rotation without any new drawings being necessary on the artist’s part. 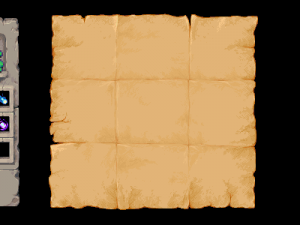 We’ve wanted to have these in the game for quite a while; technically, we’ve been able to do them since the early alpha versions of our engine (Anura), but in practice they’ve been a buggy mess. The system I’ve come up with is no holy grail (there are a number of fancy animation-scripting things that still have to be done by hand), but it’s very, very clean, and should stay fairly bug-free. One of our main goals was to have these sprites, to the player’s eye, seem like a seamless extension of the core object they were a part of. Any damage-contact applied to any part of these should act like they’re one, indivisible object; any visual effects like color-flashing should affect the entire thing, without any inter-frame delays. Chiefly, we’re also worried about orphaning these child objects – if the core enemy they’re attached to, dies, we need to have a reliable system for getting rid of them. Bug-free designs are really our top priority at this point; we had some compound enemies in the past and I’ve actually ended up mothballing a few of them because it was too much work to keep them running as they broke over and over due to other changes in the game. A tough lesson I’ve learned in game-design has been to resist the siren song of new features that I can’t quite come up with a rigorous way to handle; they might not take any longer to prototype than anything else, but I can’t treat a working prototype as a “bird in the hand”. I have to treat the real cost of features as the full, lifecycle cost of all the future bugs its going to incur as it interfaces with other elements in the game. Thus, I need to focus on things that have a way lower lifecycle cost – which is usually down to ‘devil in the details’ planning of how they work. It’s less about what I do, so much as it is about holding off unless I’ve got a really clean way to do something. There are plenty of “cool 2d platformer tropes” we’re leaving on the shelf unless they can meet this requirement, but the result is we’ll actually ship the damn game, so it’s a small price to pay. As for the new compound-object system; there are several specific things that finally made it viable. Most of it had to do with some major, structural improvements to our “hittable” class (a long, ongoing project over the last year or so). Most of these have been down to a transition away from a type/recipient-blind “event-driven” system, and instead moving to a pure-functional, strict typed means of triggering behavior. A lot of this has been enabled by some huge upgrades to Anura’s scripting language, making it strictly typed – most especially with regards to non-null containers, and object access – we now can have hard, static-analysis guarantees that if we’re operating on some set of links to other objects (like, say, compound object parts) that we’re guaranteed to be pointing at a real, object, and not something that had been deallocated earlier. A big benefit here is that our hittable code has a very limited set of entry points; we’ve got one place where hit-triggering behavior gets captured, and this can safely redirect calls for being hit to a parent object (and thus make sure the full suite of damage-receiving code gets triggered correctly). Hopefully this will bulletproof the few enemies we have based on compound objects, and let us gradually ease into doing more in the future. We’ve been making some update posts over on our steam greenlight page for a while now, without cross-posting them here. I’m going to start backporting a few of them to here, and try to keep up with consistently cross-posting them in the future. A long-running project we’ve had going has been upgrading the animations on all of our older monsters. New monsters we’ve been making from scratch have high frame counts from the get-go; we had several older creatures which didn’t (In the pending release, we’ve just about doubled the number of creatures in the game). 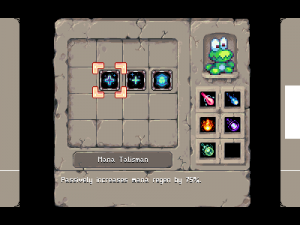 Like a lot of indie game projects, frogatto has been one of those where we’ve been “learning as we go” – our older art was cheaper because my skillset was a lot weaker when I made it. Two of the points of cheapness were that most of the animations had a very low frame-count (about 3 or 4 frames for most “cyclical” animations like walking and flapping), and most of the old monsters were “clones” of each other – they were a similar base body design, recolored, with a few cosmetic bits tweaked to make them look “different enough” whilst allowing most of the animations to be copy-pasteable (with similar recoloring tricks, etc). The problem with cloning like that is it becomes noticeable after a while – do it too much and even the less aesthetically-inclined players start to notice and it cheapens the experience. Fortunately there were few enough of them that I don’t think we need to actually rip them out – instead, we just needed to draw a line in the sand and say “let’s make sure all of the new ones we add are brand-new designs”. The upside of keeping these existing ones is that if I upgrade one of the core animations for them (like the ant walk cycle, or the flying-ant flap cycle), I can copy over the improvements to all of the other clones and get a lot of bang for the buck – get dramatically better animations on a bunch of creatures for fairly little effort. So in the last few weeks, I took the flying ant’s core animation and applied it to about 4 other creatures which are seen in the seaside chapter of the game, and a couple creatures seen in the cave chapter of the game. If you’re familiar with the earlier releases of the game, we’ve got one lonely miniboss fight – one stage where you’re locked in a room and have to fight against 4 regular “kitty” enemies. In that particular fight’s case, it’s a fairly easy battle used to introduce one of the main enemy types in the game, and force the player to familiarize themselves with how the enemies work. We’re going to be adding something like 5 or 6 more such fights in the coming release. I like these because by putting a simple twist on how a creature is presented in its environment, an existing monster’s challenge-factor can be radically changed (A metaphor I frequently use to explain this is that a sniper in the middle of an empty parking lot is a lot less dangerous than a sniper in a cluttered urban setting). Not only is it good for mixing things up gameplaywise, it’s also good for forcing the player to learn-by-doing, and it’s great for narrative cycles; for adding climax and surprise to different chapters of the game. It’s a shame we haven’t done this before; a number of sections we’ve had in the game prior have been completely devoid of boss-fights, and it really made them feel flat. This, as well as the two new actbosses we’ve finished are really going to help spice things up. So far we’ve got two of these two miniboss fights mostly done, and we’re got a third one well on its way. Some of the earlier seaside levels date back to the beta of the game – they’ve been reskinned as we’ve redone our graphics, but their basic layout remains the game – especially in the flaw of being a pretty straight-shot linear run from left to right. I’ve gone over a couple of them (the levels “Splash Hop”, and “Burn and Bubble”) and added some major puzzles to them (where there were no puzzles, before), and I’ve greatly increased the size of them, vertically, adding additional paths you can take through the level, each with its own unique challenges. I’m also in the process of re-adding a great old level we used to have called “Stonepipe Flats” which was made during the beta and got dropped for no really good reason other than me being too lazy to reskin it after one of the big graphical makeovers. It’s high time it had a moment in the spotlight, since it’s a fairly nice level with a few good puzzles on it. – One of the big goals in this release is to get a professional level of polish on our bosses. We’re trying to stamp out as many of the “trivial exploits” you can use to ‘cheap out’ a boss and take it down much more easily than intended. We want the bosses to fairly telegraph their moves (no random, sudden motions that aren’t predictable), but we also want the bosses to be very, very challenging. This is a really difficult balance to achieve, and it’s very time-consuming work, which is why we’ve neglected it in previous releases in favor of building out other content. There’s a reason many traditional 16-bit games had a few employees dedicated solely to writing the bosses for a given game. – Related to this, we’ve added two new act bosses (on the same scale as Milgram) in the forest section. I’m not going to spoil them in this post, other than to say that I’m quite proud of what I’ve done. – Frogatto now has two different paths to take through the forest. Each route route features new enemies, and also has some new and unusual platforming puzzles in it, very different from the rest of the game. – The forest now has a town in it, called Tempo Village. You should visit it sometime, I hear it’s nice there this time of year. – We’re trying to make monster encounters more interesting. Right now, if the player is intent on just progressing forward in the game, a lot of our monsters really aren’t very interesting. They’re similar to designs in many other games, but because Frogatto (the character) is incredibly agile and fast compared to most platforming characters, Frogatto can get past these by just jumping over them (unlike, say, Simon Belmont). It’s frustrating; we’re committed to having a really fluid, agile character, because the stiffness of many traditional game characters has always been something that bugged us. We also want to do this because we feel like it’s an obvious point-of-improvement that’s unfairly neglected; a cop-out a lot of existing games make, and an obvious point for us to innovate on – but the reason it isn’t done is exactly what vexes us: if we want to have a really agile character, we have to work much harder to make sufficiently interesting enemies. We can’t just make a goomba clone (which a surprising number of castlevania enemies were), and call it a day. I describe “sufficiently interesting” as an enemy that arrests the player’s forward progress, and forces the player to confront the monster and either dispatch it or carefully dodge it before proceeding – something that demands the player’s attention. The guiding principle here is a classic quote by legendary game designer Sid Meier: “A great game is a series of interesting choices. (emphasis mine)” – the biggest problem we have is that jumping over an enemy, if it’s always the default fallback, isn’t an interesting choice. Choices have to be novel. We’re doing a mix here of adding entirely new enemy types, and making the existing enemies more interesting. Quite a few existing enemies are perfectly serviceable designs, but in their existing usage, have been placed in fairly uninteresting situations. For example, a spiked, indestructible enemy is an entirely different beast when filling the breadth of a small tunnel, or when sitting on a small pedestal; as opposed to when sitting on top of flat, open ground. By not being able to move around it, you’re forced to strategize – to stop and think. Solving puzzles like that is what makes games fun; it’s the basic reward mechanism. It’s taken a while to understand this deeply enough to apply it to our own work, but our hope is that Frogatto will come out of this much more fun than it has been in the past. – Related to this, we’ve built out a full damage-type and creature-type interaction system (similar to Pokémon and quite a few RPGs). Different kinds of damage do different things to different kinds of creatures. Part of this is that there are now secret areas in the game which you’ll only be able to access with a certain kind of damage to break through obstructions – usually a type of damage you won’t get until much later. We’ve worked these into the grab-and-spit mechanic, as well: you can grab objects, and “infuse” them with an elemental attack when you next spit them out. 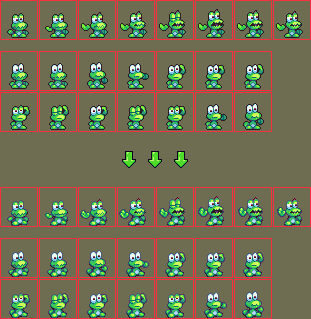 Hopefully this will all add up to make Frogatto a heck of a lot better for the next release. Good news, everybody! 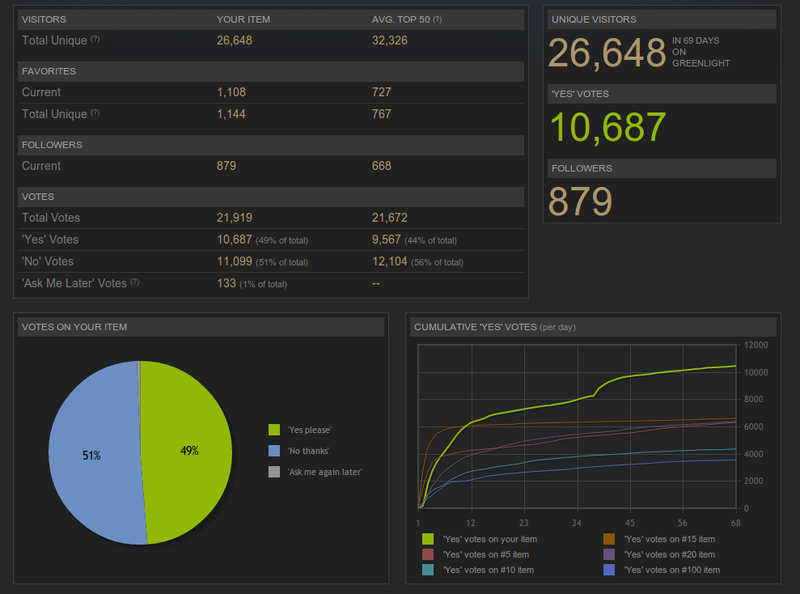 We’re greenlit, we’re coming to Steam! In more practical matters, Steam will be getting Frogatto version 4.0 and up. We expect to be able to release this in half a year or so, by the summer of 2014. 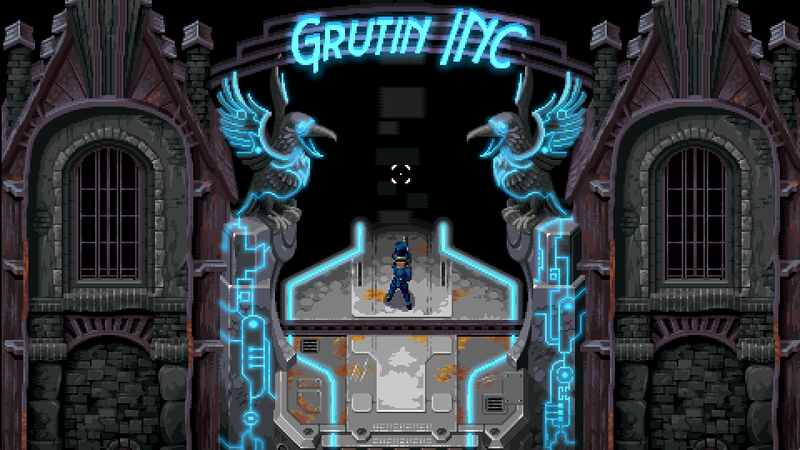 The new version will feature better graphics, two new bosses, and much nicer powerup system. Stay tuned for more information via RSS or Twitter.